I have been known to plunk down a pretty penny or two on the right restaurant. For instance, I recently dined at the Eiffel Tower Restaurant at the Paris Hotel in Las Vegas. In a scaled-down recreation of the real Eiffel Tower, there is a restaurant on the Las Vegas Strip that overlooks the Bellagio fountains across the street, while patrons dine on escargot, French pastries and sip on wines directly from Bordeaux. I loved the experience and it is easily one of the highlights in my culinary quest for an amazing dining experience. And yet, that was small potatoes compared to what I think may be the world’s ultimate dining experience. 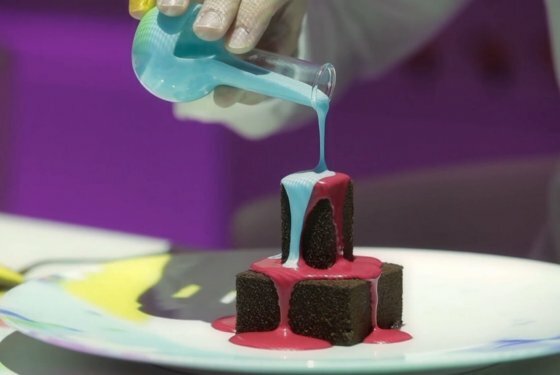 Located at the Hard Rock Hotel in Ibiza, Spain, Sublimotion will be a 20-course meal designed to stimulate all the senses that will set you back (please make sure you are sitting down) $2,000 per person. After you recover from the initial sticker shock, keep in mind this is no ordinary meal at an ordinary restaurant. Designed by Paco Roncero, a two-star Michelin chef for his restaurant La Terraza del Casino in Madrid. The chef and restaurateur currently has five restaurants around the world, not including the upcoming SubliMotion. With only 12 diners per “performance,” Sublimotion is an extremely intimate dining experience in probably the most high-tech dining room ever created. This intimate space can control everything from aromas to lighting to sound and even humidity. Most impressive is the projection system that uses virtual mapping technology often seen in theme parks such as Disney’s The Magic, Memories and You show seen at the Magic Kingdom or in Atlantic City at the Boardwalk Dance Hall. This virtual mapping turns the table into a garden with dancing flowers or can make your white chocolate soufflé look like a dancing mushroom. The possibilities are endless and most importantly, interchangeable based on the season or menu variations. The decor is controlled by an operator who is monitoring everything in the dining room. This operator can change the scenes based on course or even having the table explode with color after a diner takes their first bite of a dish. Sounds a bit pretentious, doesn’t it? I suppose you have to talk up a big game if you’re planning on charging roughly two grand per person. Personally, while I would max out a credit card, I could see myself doing this once in my life. 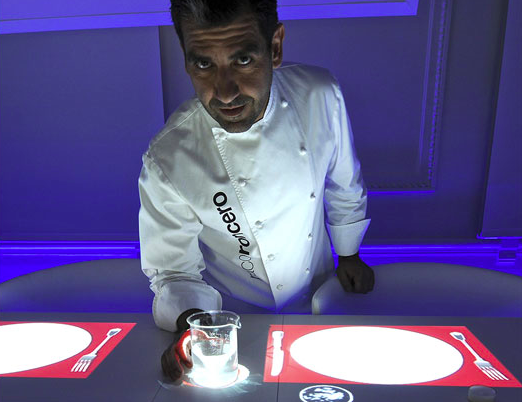 What are your thoughts on combining this technology with a dining experience? Make sure and follow Theme Park University on Twitter and like our Facebook Page! This entry was posted in Dinner shows, Outside The Parks and tagged Hard Rock Hotel Ibiza, Immersive Dining, Paco Roncero, Sublimotion. Bookmark the permalink. Trackbacks are closed, but you can post a comment.